Changing minds can be rewarding - in more ways than one! Come up with a project to fight homophobia, make it happen and present it to us! You can therefore be eligible to win a $2,000 grant, see your efforts recognized, and inspire others. What is the GRIS-Simple Plan Foundation prize? 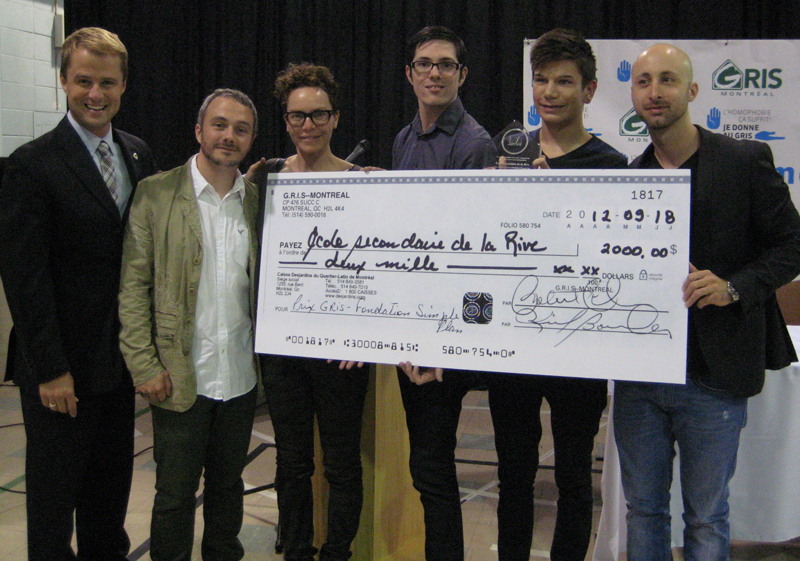 The GRIS-Simple Plan Foundation Prize is an initiative between GRIS-Montréal and GRIS-Québec with the support of the rock group Simple Plan that rewards your innovative projects to fight homophobia. You’re a student, an educational stakeholder in a primary or secondary school? Submit your application by June 30! Your projects will be judged on their innovative character, the ease with which they can be reproduced in other schools, and they impact they had on your community. You win a $2,000 grant, a commemorative plaque, a certificate for each person involved in the project, and the guarantee of erasing several prejudices! Please note that in order to respect the philosophy of the prize, winners must use the grant to finance future activities in their school community, aimed this time at fighting every form of discrimination (racism, sexism, homophobia, etc.). What projects have already been presented? A week of activities organized to fight homophobia with workshops, quiz, etc. Creation and sale of “You don’t have to be gay to stand up for gay rights” t-shirts. Creation of a giant painting representing inspiring homosexual people, because of their work, their life, or their activities. Removing the firewall from a school’s IT system in order to allow access to serious sites with information about homosexuality. 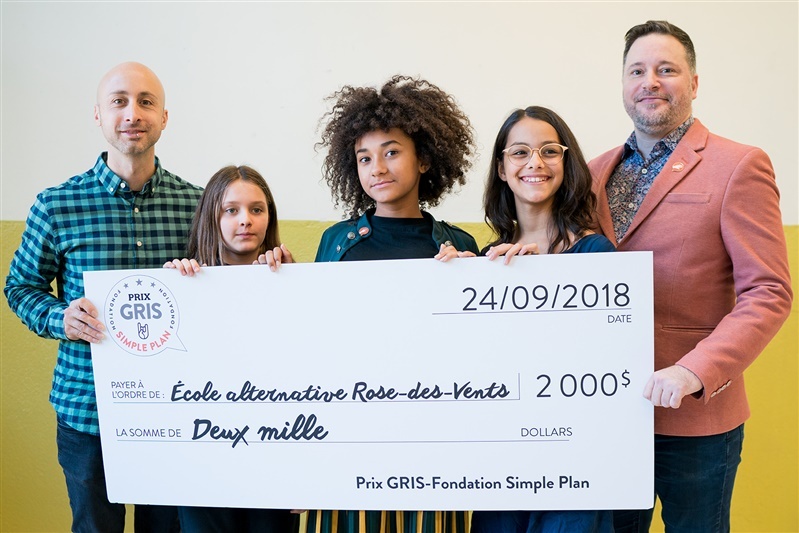 The GRIS-Simple Plan Foundation Prize is open to all projects aimed at fighting homophobia or demystifying homosexuality and bisexuality, carried out in a primary or secondary school in Quebec. The project can have been completed by one or more community stakeholders, one or more students, or by a group made up of students and stakeholders. The project can be submitted by the person or people who completed the project, by anyone else from the school where the project was completed, or by someone outside of the school who knew about the project. In these last two cases, it is preferable to involved the people who carried out the project in drafting the application and that one of them sign the application form. The project must have been completed within the current school year, except for initiatives that are permanent in nature. The deadline for submitting applications is June 30. The projects will be judged on their innovative character, the ease with which they can be reproduced in other schools, and they impact they had on their community. The jury also reserves the right to give out a special prize, in the form they deem appropriate, to a young person or young people who carried out a project that clearly stands out from the other projects submitted, either because of its quality, its size, or its originality. A jury will be selected by GRIS-Montréal for the western Quebec prize and by GRIS-Québec for eastern Quebec. The juries’ decisions will be final and without appeal. The western Quebec will be handed out in September, during the press conference organized for the launch of GRIS-Montréal’s annual fundraising campaign. The eastern Quebec will handed out in September as part of the Fête Arc-en Ciel, which GRIS-Québec participates in. Le prix GRIS-Fondation Simple Plan 2018 a été décerné à trois élèves de l’École alternative Rose-des-Vents qui ont écrit un livre sur l’histoire fictive d’Alexandra, une jeune fille trans à la recherche d’elle-même. Maïté, Zéna et Éléonore – les trois jeunes camarades de 4e, 5e et 6e année du primaire – ont mené leur projet de main de maître, du début jusqu’à la fin. Afin de donner la bonne définition de l’acronyme LGBT+ et d’offrir un ouvrage de qualité, elles ont discuté avec une sexologue et rencontré des personnes de la communauté LGBT, dont l’auteur Simon Boulerice. Résultat : leur livre a été imprimé en 125 exemplaires et à travers celui-ci, tous les élèves de l’école (de la première à la 6e année) ont eu l’occasion de mieux comprendre les réalités LGBT+. Félicitations! On the occasion of the launch of our 14th fundraising campaign, the GRIS-Fondation Simple Plan Prize was awarded to Mount Royal High School. The energetic committee of 14 young promoters, instigators and interveners of the project, sensitized their environment on the LGBTQ + the realities of their lives. The week against homophobia, they created a tangible difference in their school. No fewer than 980 students were impacted by their actions (selling cupcakes and bracelets, designing posters, running a quiz on the LGBTQ + community and taking a rainbow photo) . This inspiring group of young people decided that it was essential to stand up against homophobia. They showed desire to build a more inclusive school, and have been the driving force of change throughout the year. Congratulations on your exemplary commitment! 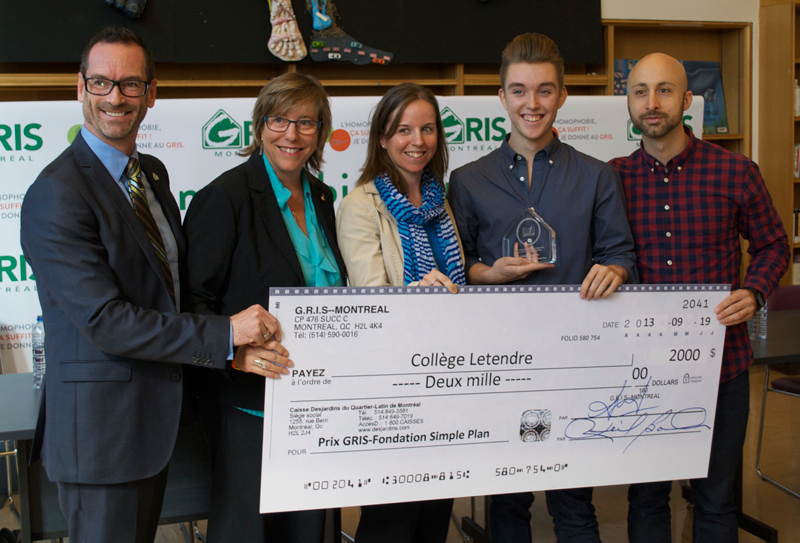 During the launch of our 13th fundraising campaign the GRIS-Simple Plan Foundation Prize was handed out to the Collège de Montréal at the Oka secondary school. The dynamic Groupe 101 who are behind the winning project is made up of a dozen secondary students. Taking equality to hear, this group put together a long list of activities that didn’t go unnoticed in their school: the creation of a human flag in colours of the rainbow, broadcasting informative messages over the school intercom on the International Day Against Homophobia and Transphobia, the creation of sweaters, involvement in the Oxfam-Québec World Walk or awareness-raising videos. Two actions were especially appreciated by the members of the jury and the rock group Simple Plan, the prize’s partner: the hand in hand operation organized for Valentine’s Day and the poster campaign called “L’homophobie, ça n’a pas de sens” [Homophobia Doesn’t Make Any Sense] on their Facebook page. Congratulations! 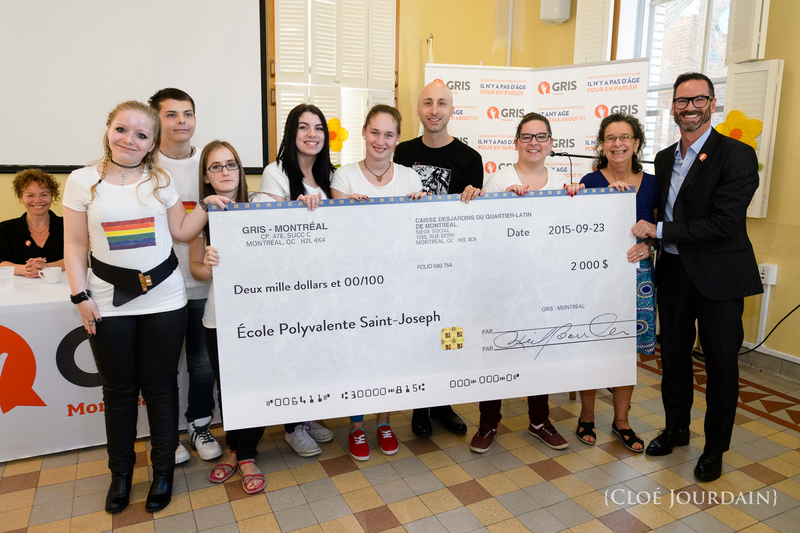 For the 12th annual fundraising campaign, Jeff Stinco, member of the rock group Simple Plan and members of GRIS gave the GRIS-Simple Plan Foundation Prize to Saint-Joseph de Mont-Laurier secondary school in recognition of their project called “Stoppons l’homophobie” [Let’s Stop Homophobia]. This wide-ranging project included several aspects that had a concrete impact in their school. Creating the posters, a Facebook page, and t-shirts with the slogan “contre l’homophobie” [against homophobia], as well as distributing stickers and pamphlets allowed to raise awareness among students about homophobic prejudices. A survey and a quiz were also distributed which, on the one hand, measured the students’ comfort level with homosexuality and bisexuality, and also tested their knowledge on these subjects, all while providing the right answers. The phys ed teachers were invited to participate in the project and made information capsules on homophobia in sports. All of these initiatives were so successful that they received local media attention. 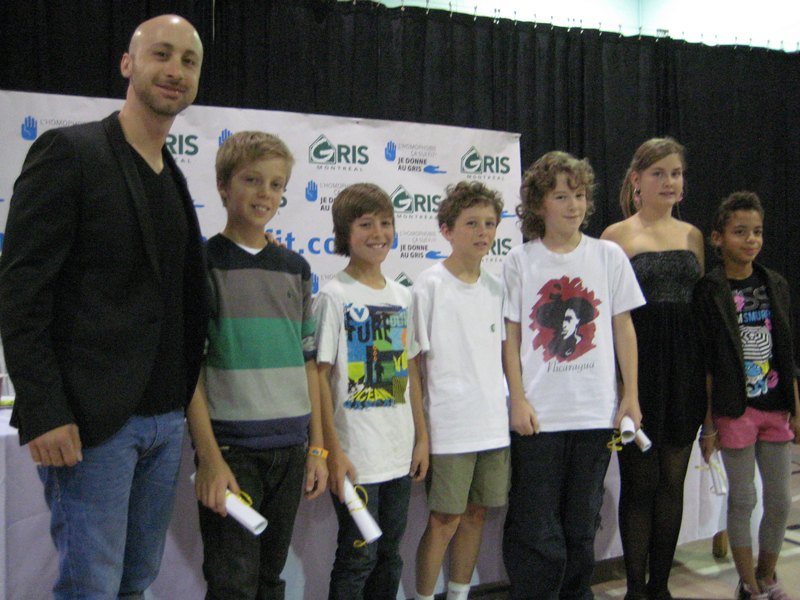 At our annual press conference held on September 14, Jeff Stinco, part of the rock group Simple Plan and representative of the group’s foundation, handed out the 5th GRIS-Simple Plan Foundation Prize to Mountainview primary school. Starting on November 28, 2013, the Week against Homophobia organized by the school and its 288 students (from kindergarten to sixth grade) was hugely successful. All week long, each student had the chance to follow workshops relevant to their age and level of understanding. All classes learned the meaning of the rainbow flag and created a rainbow poster which they signed to commit to not bullying their peers. At the end of the work, the school organized a large assembly where the young kids sang “Love Makes a Family”, which they had practised all week. The older students shared their thoughts about the Week against Homophobia and read poems denouncing homophobia and encouraging sexual diversity. The project also stood out because of the willingness of the school to inform parents about their motivation to bring this week to life for the students. They created a pamphlet demystifying different sexual orientations and explaining why this cause is important for the school, showing at the same time the importance of being open to differences. The prize was given to the Rive de Lavaltrie secondary school and the Comité de lutte contre l’homophobie whose role was to create a committee to raise awareness within the school. Made up of students from fourth secondary and a teacher, the committee worked on several actions aimed at raising awareness, demystifying and offering resources. They started by making a banner that students were invited to write their own difference and to sign it. Then the banner was hung up in the school for the rest of the year. The students also created an ally network: teachers and students were invited to wear badges or stickers to show their openness to diversity. The committee also highlighted the International Day Against Homophobia by inviting students to dress in one of the six colours of the Pride flag. A picture of people representing a human flag was taken. Lastly, they created a collection of testimonies from lesbians, gays, or bisexuals in their school or who attended there to help questioning students. A list of available resources was also included in the collection. The selection committee also gave a special mention to the alternative elementary school Atelier d’Ahuntsic’s project Adoption d’un prisonnier politique [Adopt a political prisoner]. During a visit from representatives from Amnesty International to their school, students learned about a Cameroonian sentenced to 36 months in prison for homosexuality. Upset about this injustice, the youth at the primary school decided to “adopt him” and to write letters of encouragement to him each month and to make drawings for him. What started as a project of the young UNESCO committee, quickly turned into all of the classes participating by writing words of encouragement or drawing. A photo of the prisoner was hung up in each class. 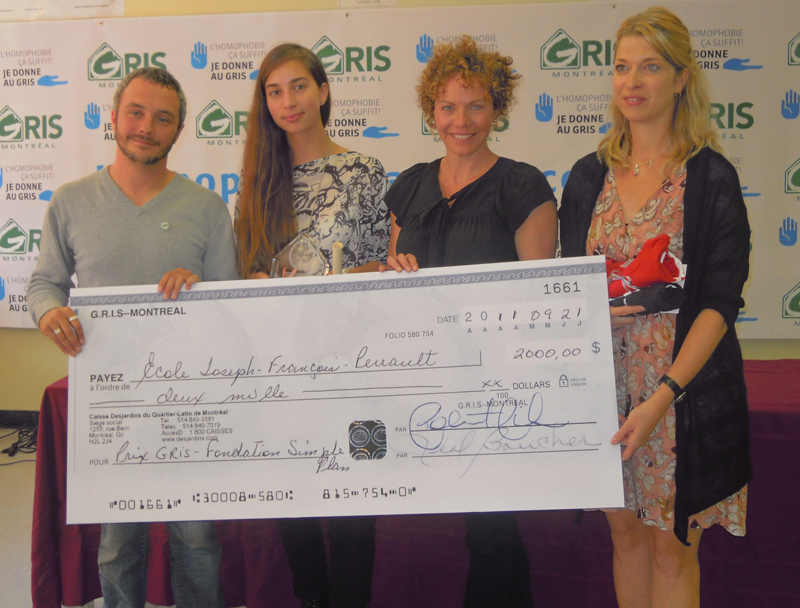 GRIS-Montréal gave the GRIS-Simple Plan Foundation Prize to Joseph-François-Perrault school in Montréal. The documentary Du pareil au meme [It’s all the same] was started by Fatine-Violette Sabiri, a student in secondary V, and took place over several weeks. Fatine-Violette undertook the project on her own first by organizing a visit from GRIS-Montréal volunteers to a secondary IV class. At this point and up until January 2011, she planned, organized, carried out and filmed several interviews and meetings with different volunteers in order to present a thirty-minute documentary to students on February 1st and 2, 2011. Addressing several aspects of homosexuality (coming out, reactions from those around you, the Pride parade, etc.) her touching and hopeful documentary sought to demonstrate that regardless of attraction, everyone is equal and humans foremost. 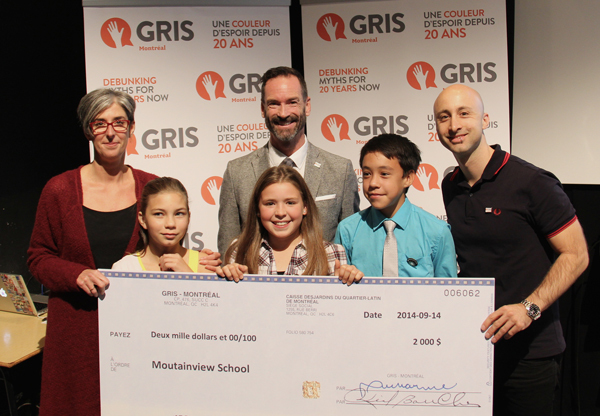 GRIS-Montréal gave Bourget secondary school in Rigaud the first $2,000 grant awarded for western Quebec. Chantal Charpentier, psychoeducator, created and piloted the winning project L’homophobie, non merci! [Homophobia, no thanks!] in her institution. From April to June, several activities were carried out with all of the students, from primary V to secondary V. As well as bringing in volunteers from GRIS-Montréal to all of the classes at these levels, she enlisted students groups to create posters and produce two videos about accepting difference, with one addressing the affect of homophobic speech and behaviour, among other things. 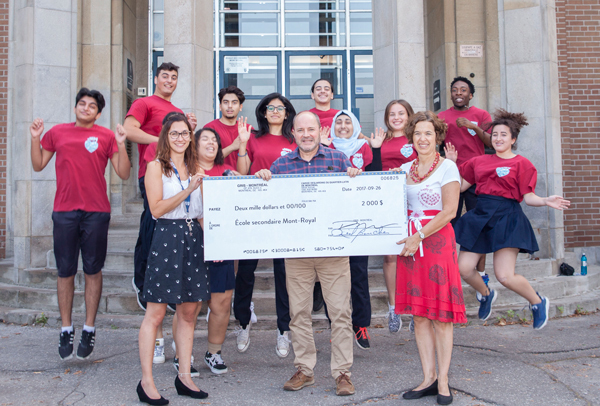 The prize was handed out to Mont-Saint-Louis secondary school in Montréal for its activity Abattons les préjugés [Let’s defeats prejudices!] Twelve students from secondary III, IV and V, under the supervision of a technician in specialized intervention and the school’s psychoeducator, organized an activity that encouraged their peers to explode prejudices around homosexuality, prejudices that the students in charge of the project had written on balloons filled with paint. By exploding the balloons, a rainbow-coloured flag, a symbol associated with gay pride, was slowly revealed. The students in charge of the project wanted to create an easy, clear and recreational activity, using energy to attract a crowd and focus on the message. They organized their kiosk on May 21, 2009, a couple days after the International Day Against Homophobia. 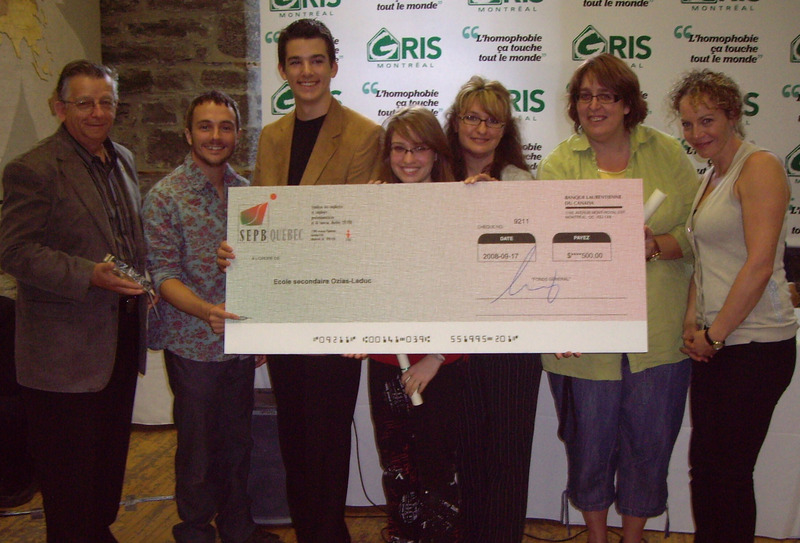 The prize was handed out the Ozias-Leduc secondary school in Mont-St-Hilaire for creating the musical Elles [She], whose main theme was homosexuality amongst women. A student in secondary V, Andréanne St-Louis, wrote the play, including the words and the music to 19 songs. She also directed and produced it, supported by two other students, Benjamin Samson and Arica Cabral. Fifty-five students were involved in the project over the course of a year, under the supervision of several teachers, and the show was presented to more than 700 students and parents of students. The first prize was given out to Durocher Saint-Lambert secondary school in St-Lambert for organizing a giant petition. Those who signed it agreed to not make any more homophobic comments. “Je m’engage à cesser d’utiliser des expressions homophobes” [I accept to stop using homophobic expressions] was organized in October 2006, as part of a special day against homophobia. To support this initiative, yellow ribbons symbolizing openness and respect for all sexual orientations were handed out to and proudly worn by the students and teachers who signed the petition. The symbol of the ribbon was meant to be a reminder that words carry weight and that homophobic insults can weigh heavily on those who are subjected to them.